Mike Ullery | AIM Media Midwest Brenna Miller, 16, right, and her brother, Bryan, 18, drive their pigs as they count down the days to their animals showing at the Miami County Fair, which begins on Friday. COVINGTON — Every day at 6 a.m., you won’t find Bryan Miller sound asleep in bed like a typical teenager. Miller, 18, starts every morning before the sun comes up in the barn, feeding his siblings’ show stock gilts and barrows until he leaves for work at 8 a.m at Ebberts in Covington. 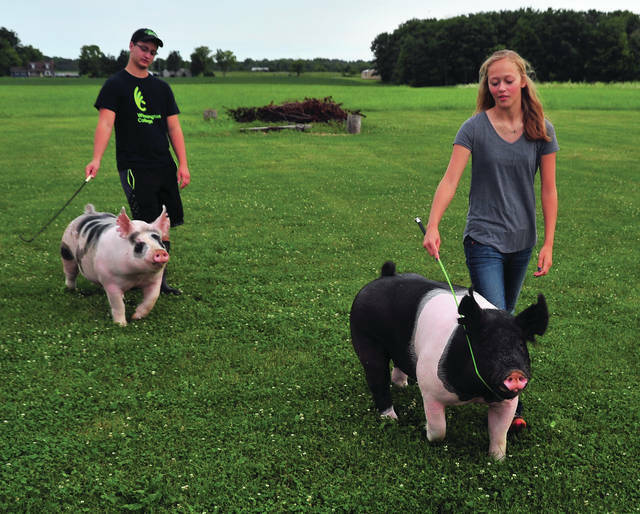 While Bryan is at work, his sister Brenna, 16, takes over, walking the pigs for exercise around the family’s yard outside of Covington. In the evenings, the pair spends another three to four hours working with their pigs well after the sun goes down. “I walk two, she’ll walk two. Of course, the two she walks could walk for hours and the two I had ended up fighting me the whole time,” he said with a grin. It’s a tradition in the Miller family following in their mother Debi’s footsteps, showing pigs at the county fair. Bryan shared how he first started picking out 4-H projects with his grandfather, Eldon Flora, who passed away in 2013. Bryan still has dear memories going to pig sales in the spring, then watching hog shows throughout the summer with his grandfather. Bryan enjoys the feeding and nutrition side of raising pigs, trying different techniques to get the hogs looking their best in the show ring. Bryan credits the help of local breeder Mike Clark, guiding him in the hog barn with his projects since his grandfather passed. Brenna enjoys the showmanship side of showing hogs. Bryan shared how their livestock projects are their own — from selecting and purchasing the pigs during spring sales and paying for their care through fall. Bryan uses the funds from his job to pay for feed while Brenna babysits to pay for shavings for the animal’s bedding. “It’s truly our project and not (our parents). They let me pick them out, bid on them and buy them. We pay for the feed and shavings all summer. It’s truly our project, so I think it’s what makes it more special to do well,” he said. It’s Bryan’s 10th year of 4-H. Bryan graduated from Covington High School in May and will attend Wilmington College to major in animal science and minor in business. He then plans to get a master’s degree from The Ohio State University in swine nutrition. Brenna, a junior, will study medical technology at Upper Valley Career Center this fall. The pair also helps their 12-year-old brother Britton with his 4-H barrow project. Their hard work paid off at the Ohio State Fair last week. They placed first in class twice and placed second twice in a state fair classes. Brenna brought home a fourth overall banner in the Berkshire breed division at the Ohio State Fair. The Millers are members of the Premier Livestock Club. Their parents are Jamie and Debi Miller of Covington. 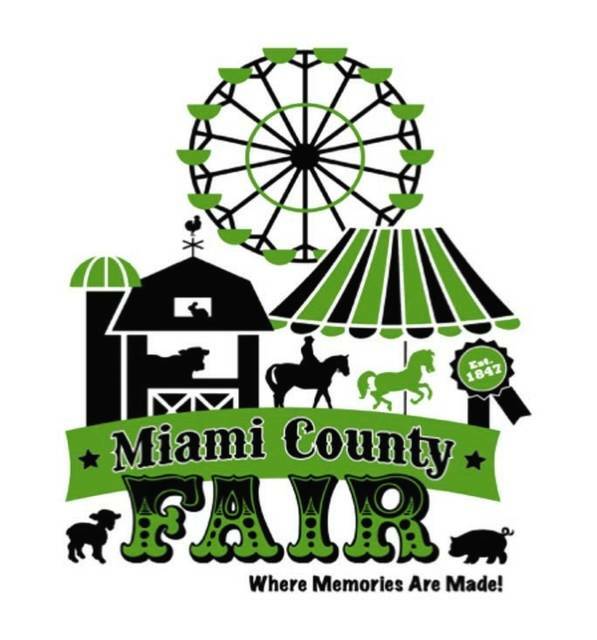 The Millers will show five gilts through Sunday and then show five market barrows through Wednesday. Bryan will then go straight from the county fair to show pigs at the Indiana State Fair — missing his first class of college to pursue what he loves. “I’ll catch up,” Bryan said with a smile as he led another pig out of its pen to get one more round in the yard. https://www.dailycall.com/wp-content/uploads/sites/30/2018/08/web1_080718mju_fair_millerpigs-1.jpgMike Ullery | AIM Media Midwest Brenna Miller, 16, right, and her brother, Bryan, 18, drive their pigs as they count down the days to their animals showing at the Miami County Fair, which begins on Friday.